*The greatest challenge is how to take the tough decisions, do the difficult things, and keep the people’s support. I suppose you cannot be a Buhari and shy away from tough decisions, and the President has not been afraid to take the bold decisions even when they are criticized. REMARKS BY VICE PRESIDENT YEMI OSINBAJO AT THE BOOK PRESENTATION - "MAKING STEADY, SUSTAINABLE PROGRESS FOR NIGERIAN’S PEACE AND PROSPERITY – A MID-TERM SCORECARD ON THE BUHARI ADMINISTRATION” AT THE OLD BANQUET HALL, STATE HOUSE, ABUJA, ON 16/11/2017. This book is a book that contains a lot that has been achieved by the present administration, but I must say there is still a lot that has not been covered on account of the fact that this book was meant to have been presented in May but we thought we would wait until the President returned before presenting it. Some things have not been included in the book and I might just supply some of that. One of such things, is the exemplary frugality, the honesty and humility, and sense of humour of Mr. President. 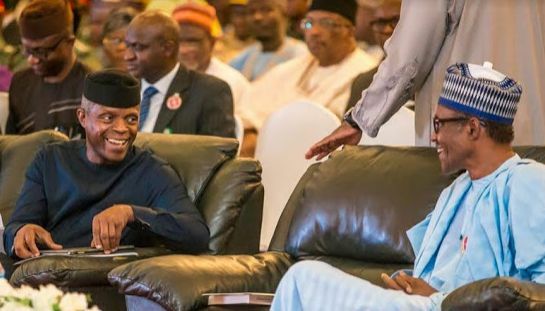 That frugality can sometimes be a problem, as you know, Mr. President decided that since government provides accommodation, food and transportation for the President and the Vice President, we didn’t need a full salary. Now how much is this salary by the way? It is public knowledge and I think it is N1, 750,000.00 or so, which is under N2million. He said he would take only half of his salary and so I had no choice but also to take over of my own salary. Unfortunately Mr. President turned down my request, to give the other half to a worthy cause – his Vice President. He didn’t consider me a more worthy cause to give half of his salary! (Laughter). In a country where politicians sometimes want to be as wealthy as Dangote, it is refreshing to have a President who most people won’t even dare to discuss any private benefit on a project let alone a bribe or a kick-back. Nigeria’s major problem is corruption, it is the main reason for the depletion of our resources, such that we had no savings when oil prices fell, and we were losing over 1billion barrels a day. It was the prudence and honesty of the President that ensured that despite the economic downturn, we were able to support the States, spend N1.3trillion on capital expenditure, the largest in the history of the nation, and also to ensure we met all our other obligations, both foreign and local. I remember when he was on medical vacation, and I was speaking to him on the phone fairly regularly and giving him a rundown of what was going on, especially when he was on the first medical vacation. He said to me, “don’t worry about telling me all that is happening, I rely on your judgment keep doing your best, what if I drop dead?! You would have to run it anyway.” I had to say to him, that his dropping dead was not part of the plan. I had a good laugh, but I think it is also an understanding that leadership, is not about self-adulation and self-aggrandizement. It is first of all, an understanding and humility, knowing that you have been picked from millions of people to lead the people because you are trusted to do so, not because you are thought of as a man with all the answers but because you are trusted to be able to lead others to achieve the results. The other day, he was saying that if you paid attention to what is going on with farmers, and how well they are doing, he said one way of knowing is by recognising that they would do two things, especially farmers in the North. They would go to Hajj and marry more wives. Already, we can see the increase in the number of wives farmers are marrying. Mr. President, your Excellencies, the ultimate benefit of public service, is the ability to touch millions of lives for good or for ill, by governmental policies and actions. The reality of honest and serious minded nation building is that in the short- run, tough and unpopular decisions have to be made. The greatest challenge is how to take the tough decisions, do the difficult things, and keep the people’s support. I suppose you cannot be a Buhari and shy away from tough decisions, and the President has not been afraid to take the bold decisions even when they are criticized. What has happened so far under this government is the tough business of laying strong foundations. The first, is honesty and good governance, and prudence in government spending. The second, is in ensuring that we have an infrastructure that can sustain our economy, not now, but in the next decades. For the first time, in at least a decade, we are spending 30% on capital expenditure. As I have said earlier, we are investing heavily on rail, roads, power, and other infrastructure. When you look at rail, we are investing perhaps, the largest portion of our capital on two rail projects; the Lagos – Kano rail project and we are concessioning the Narrow Gauge, where we are building the new Standard Gauge. There is also the Lagos – Calabar route and we have also recently approved the Port Harcourt – Maiduguri route. We expect, that our country will need railways, to move the massive goods and services that we have been talking about producing all this while. Already, our roads are suffering seriously. If you look at some of what is going on around the Apapa port today, the port is already over-subscribed, almost taking twice the custom that it should ordinarily have, and that is increasing day by day. Each of these rail projects starts from the ports, all the way up to the various destinations that I have mentioned. Third, is that we are focused on agriculture and the agro-allied value chain, with our focus on cheaper and improved inputs, local fertilizer production, cheaper credit for farmers in the anchor borrowers programme. Productivity in the agricultural sector is at an all-time high. Rice imports have dropped by 70%, and we are fast becoming one of the largest producers of paddy rice in the world. Agriculture is providing more jobs than ever before, as it contributes more to GDP. More investments are coming into Agriculture. WACOT, a few months ago opened its 120,000 metric tons rice mill in Kebbi State. Indorama has also its opened 3million metric tons fertilizer plant in Rivers State, which was commissioned a few weeks ago, Dangote is investing in a total capacity of 1million metric tons of rice mills. Olam’s poultry and feed mill which recently opened in Kaduna, is the largest in the country. It is evident, that the private sector is listening, and smart money is following what government is doing. It is very clear that we are opening up the space for industry and manufacturing. You can see that from the response of the private sector and even in technology. A lot of the young people are coming in to do various forms of businesses now that they can see that the space is opening up. Our philosophy as enunciated in the Economic and Recovery Growth Plan, is to enable the private sector to lead the economy in industry and manufacturing, and especially small businesses. Of course, you have seen from the results of the World Bank’s rating of Ease of Doing Business, we are making very deliberate progress and we are moving very quickly indeed. I think the point that we should note is that, the World Bank declares us as one of the top ten reformed economies and I believe that investors are paying attention to this. You can only reform with serious discipline and I want to say that the leadership of the President has provided that discipline and we are seeing the results of this. Executive Orders have been signed on making a priority made-in-Nigeria goods in procurement. This is one of the very important policy decisions that the President made, that we must prefer made-in-Nigeria goods. In addition, we are giving priority to ensuring that pre-investment approvals are efficiently and quickly done. We also have an Executive Order for that, we are also working hard to ensure that Public Service is responsive and diligent, and it does not become an obstacle to investment and to the economy, rather a facilitator. Some of these are contained in the book. I want this audience in particular, to recognise that every single day, there is attention being paid to the needs and requirement of this country. We are a government dedicated to ensuring that we give the very best that is possible to the people of Nigeria. I would like to congratulate the Presidential Communication Team, Alhaji Lai Mohammed, Mr. Femi Adeshina, Mr. Laolu Akande and all of the team that worked very hard and have continued to work hard spending many hours on how to communicate the views of this government and its activities as well and as comprehensively as possible. I thank you all for your attention, God bless you.